Now that my eldest sister, Maisha, was twelve, none of us knew how to relate to her anymore. She had never forgiven our parents for not being rich enough to send her to school. She had been behaving like a cat that was going feral: she came home less and less frequently. staying only to change her clothes and give me some money to pass on to our parents. When home, she avoided them as best she could, as if their presence reminded her of too many things in our lives that needed money. Though she would snap at Baba occasionally, she never said anything to Mama. Sometimes Mama went out of her way to provoke her. "Malaya! Whore! You don't even have breasts yet!" she'd say. Maisha would ignore her. - p. 5, from the short story "An Ex-mas Feast"
You could hear hundreds of shoes shuffling on what we called the "German floor" as worshippers walked in and found their places among pews, which, for now, were planks set on blocks. 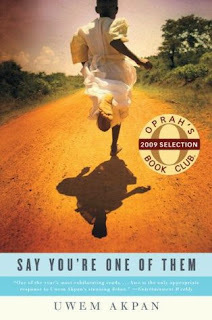 p. 56, from the short story "Fattening for Gabon"
Synopsis of Say You're One of Them by Uwem Akpan: Each story in this jubilantly acclaimed collection pays testament to the wisdom and resilience of children, even in the face of the most agonizing circumstances. A family living in a makeshift shanty in urban Kenya scurries to find gifts of any kind for the impending Christmas holiday. A Rwandan girl relates her family's struggles to maintain a facade of normalcy amid unspeakable acts. A young brother and sister cope with their uncle's attempt to sell them into slavery. Aboard a bus filled with refugees—a microcosm of today's Africa—a Muslim boy summons his faith to bear a treacherous ride across Nigeria. Through the eyes of childhood friends the emotional toll of religious conflict in Ethiopia becomes viscerally clear. I'm hoping to get back on track soon with some reviews. In the meanwhile, I was going through my old favourites and couldn't believe I'd never featured Say You're One of Them! It's an amazing collection of short stories, each told from a child's viewpoint. It's a brutal read but it is one that will stay with me. It's one of those books I'd recommend to anyone who isn't afraid to be shocked by how brutal reality can be. Here's a link to my review if you'd like to find out more about it. How is your summer and summer reading shaping up, friends?